I don’t make lamb often, and when I do, it is usually a rack of lamb, but the semi-boneless leg of lamb roast was on sale so I decided to give it a whirl. My recipe is loosely based on one by Bobby Flay combined with the technique for porchetta. I butterflied the leg and slathered it inside and out with a paste of parsley, garlic, lemon zest, salt, pepper and EVOO. I rolled it up, tied it together and placed it on a bed of quartered potatoes, onions and carrots. I roasted it in a 425 degree oven for 20 minutes and then lowered the oven to 350. My roast was only 2.5 pounds, so it took an additional 40 minutes to get to medium/ medium rare. I should have pulled it out a little sooner – I prefer medium rare/ rare, but I am sure Steve appreciated the lack of blood on his dinner plate. I let it rest for 30 minutes. The lamb was tender, but the flavor was more subtle than I expected. 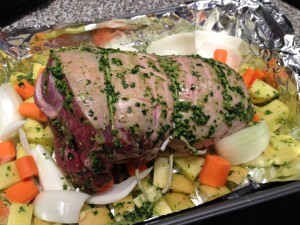 I think this was because I did not marinate the lamb – next time I will let it sit for 24 hours. It still made for a simple, hearty and delicious dinner and even better sandwiches the next day. I forgot to take a picture after, so here it is before it went in to the oven.